A beautiful smooth peanut butter in the front with heavy cream and custard notes underneath. Not too sweet. Surprisingly good right away, but develops nicely after a about a week. Became too sweet after steeping, could not taste peanut butter at all. Dropped the EM and reduced the Toasted Marshmallow and reduced Custard. Am hoping these reductions will bring the Peanut butter out. This recipe is the property of Marnu and released under the All The Flavors Public Domain license. You may not copy, derive or commercialize this recipe without following the terms of this license or the explicit permission of the creator. You did well with your adjustments from the other recipe. 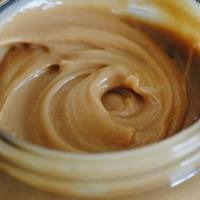 I still lose most of the peanut butter once my coils get too hot or if they get a little dry, but when I first drip this and take a few hits it's a very lovely vanilla peanut butter with a good thick mouthfeel. I'm adding this to my list of stuff to play around with, for sure.